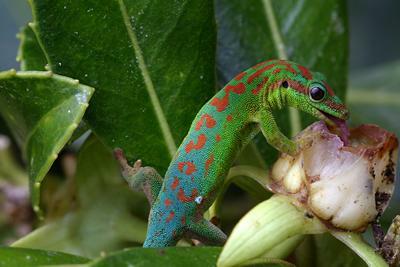 Animals like this gecko are important for pollination. Credit: Dennis Hansen, University of Zurich. The importance of birds, mammals and reptiles pollinating plants around the world is the subject of a major new study led by the University of Southampton. In the first global assessment of the importance of vertebrate pollinators to plant reproduction, scientists found that preventing vertebrates – predominantly bats and birds – from visiting flowers to feed can reduce the amount of fruits and/or seeds produced by the plants they feed on by an average of 63 per cent. In a paper published in the journal Frontiers in Ecology and the Environment the researchers say that, if you exclude bat pollinators, the result is an average reduction of 83 per cent in fruit/seed production. The figure is around 46 per cent when birds are excluded. Geographically, the dependence on vertebrate pollinators for fruit/seed production was greater in the tropics than at higher latitudes. Lead author Fabrizia Ratto, a postgraduate research student in Environmental Biosciences at the University of Southampton under the supervision of Dr Kelvin Peh, found that bat-pollinated plants were significantly more dependent on their pollinators than bird-pollinated plants. In particular, vertebrates are known to be essential for the reproduction of some economically important crop species, including dragon fruit, durian and Parkia – often known as ‘stink’ beans. Fabrizia said: “A recent global study revealed that both mammal and bird pollinators are becoming increasingly threatened with extinction over time, with an average of 2.5 species per year having moved one Red List category* towards extinction in recent decades. “Animal pollination is necessary in the life cycle of many plant species and more research is needed to understand how environmental and other factors might affect wider ecosystems in future. “With such a large potential impact of vertebrate pollinator loss, there is a clear need for prompt, effective conservation action for threatened flower-visiting vertebrate species. The team, which also included experts from the University of East Anglia, the University of Cambridge, the RSPB, BirdLife International and Mexico’s Instituto Politécnico Nacional, is calling for more research to be carried out on the pollination systems of plants and their vertebrate pollinator communities. An estimated 87.5 per cent of the world’s flowering plant species are animal pollinated with 75 per cent of the world’s major crop species benefitting to some degree from animal pollination. Over 920 species of birds – including hummingbirds, sunbirds, honeyeaters and lories - visit flowers and act as pollinators. They are known to pollinate about five per cent of the 960 cultivated species for which pollinators are known, typically pollinating around five per cent of a region’s flora and 10 per cent of island flora. Bats are the most prevalent pollinators amongst mammals, known to pollinate 528 plant species in 67 families around the world. Flower-visiting bats are mostly found amongst fruit bats in Asia and Australia and leaf-nosed bats throughout neotropical Mexico, Central and South America.